Tadaaa! It's up! It's finally up! I started working on my room in July, and I barely took pictures to share last week! We kind of hit the ground running. 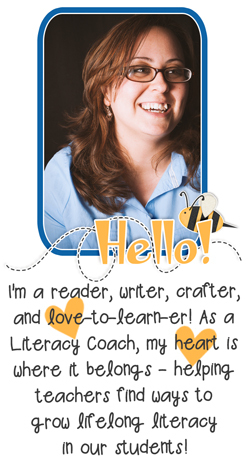 Remember, I am a literacy coach (this is my second year!). 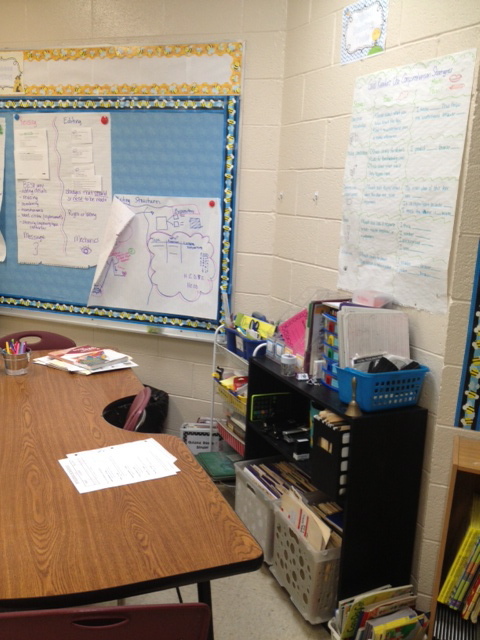 So my room isn't a just-for-kids room; it's a mostly-for-adults room, and sometimes I work with kids in it. But I believe that, in my role, I have to practice what I preach! 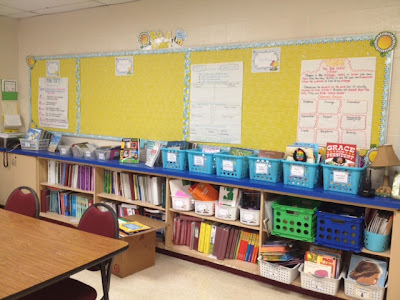 And if I'm asking teachers to have organized spaces, sorted classroom libraries, and use anchor charts to reinforce learning, I have to do it, too! Not only that, but I like a cheerful room. 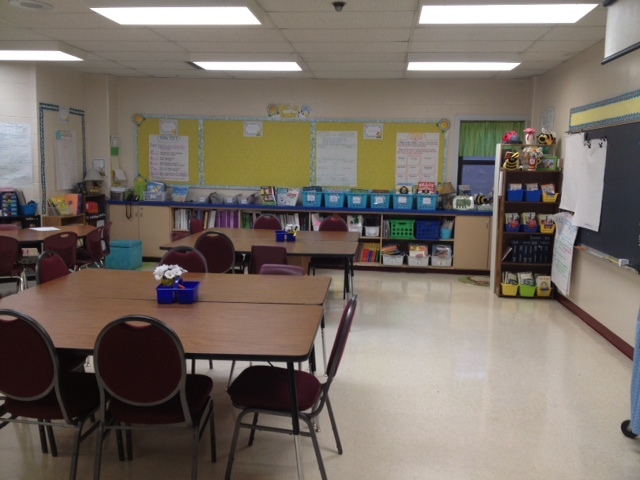 It's where I spend a lot of time, so I plan my spaces as carefully as I did in the classroom. This is the view from the door. The flower pens on the table are new this year! 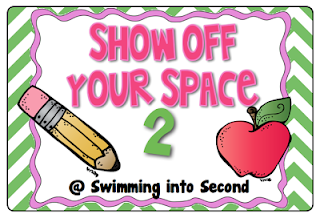 I made one for each of the teachers and then I made some extras for the tables! You can read about those here. 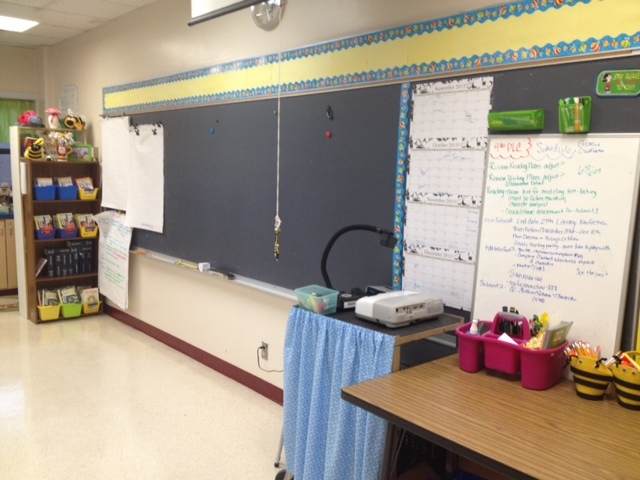 This is the front of the room. 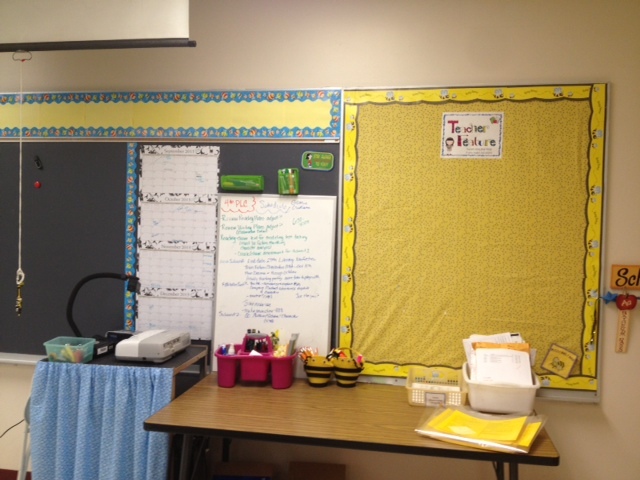 I have a dry-erase board where I make notes (mostly for myself) for when I plan with teachers. I covered my AV cart (it was hideous) and I posted the fall semester calendars vertically, so we can see what's coming! 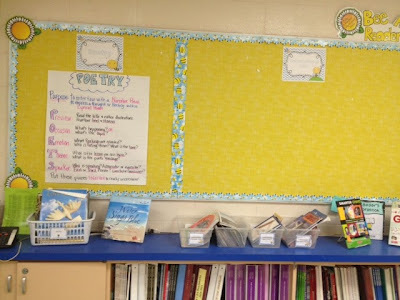 The "Teacher Feature" board is left over from last year - I'd like to try something a little different this year, like a Pinterest-themed board with pictures from our own classrooms, but I still haven't figured it out yet! This is the back wall. 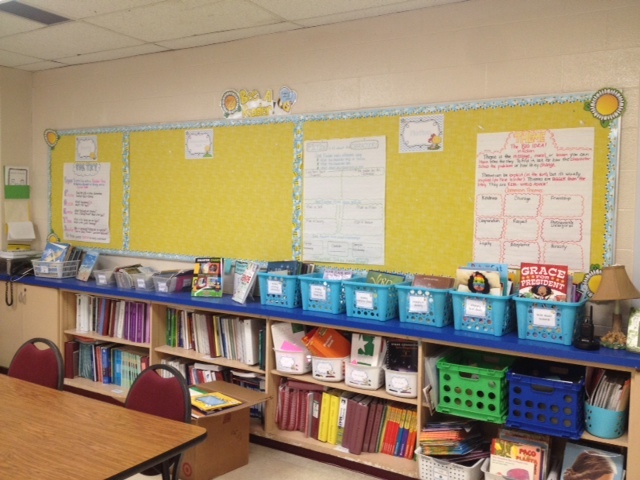 Because I'm a literacy coach, I divided up the wall into three sections: Fiction, Informational, and Poetry. 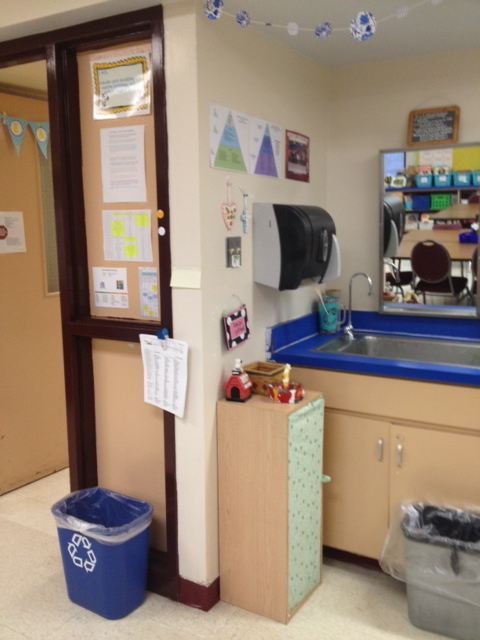 When I build charts with the teachers, they go up here as a reference for them and for other grade levels, too! This is the little corner behind the shelf of class sets of books. The Fiction Pocket Chart is a strategy we've used that I blogged about earlier this week! The window holds cute stuff! 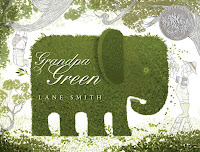 Our current Book of the Month is also featured here: Grandpa Green. Read about that here. In the bright blue baskets, I have fiction books organized by reading strategy. 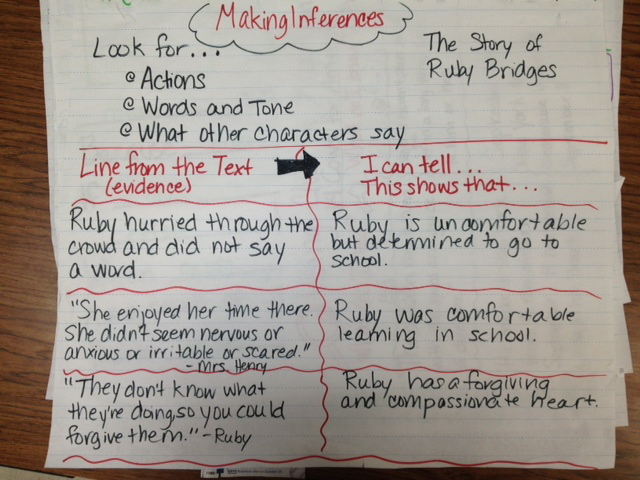 These include Character Analysis, Predictions, Inferences, etc. 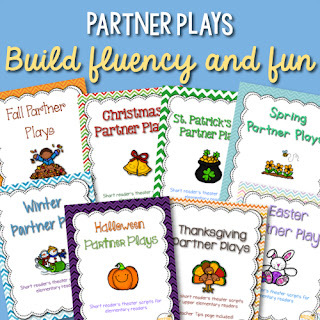 These will help us plan for these strategies more efficiently! This is the back wall from a different angle. Please ignore my giant box o' books because they're only there because I've been too lazy to take the box to the car. There's a basket of Biography/Autobiography (Literary Nonfiction), Multicultural (Theme & Culture), and Folktales, Legends & Myths. Here's the left end of the back wall. This is the informational text section (haven't started planning for this yet) and the Poetry section. 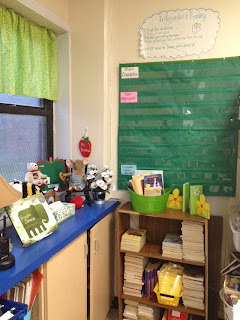 I'm going to share our Poetry sequence and anchor chart & tools soon! 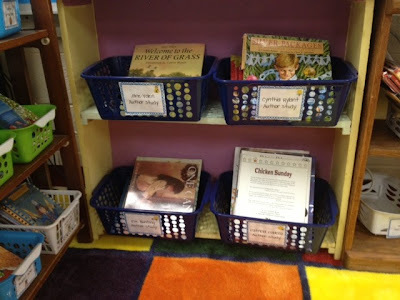 In the clear baskets are informational texts organized by procedural, good for main idea, and good for cause-effect instruction. 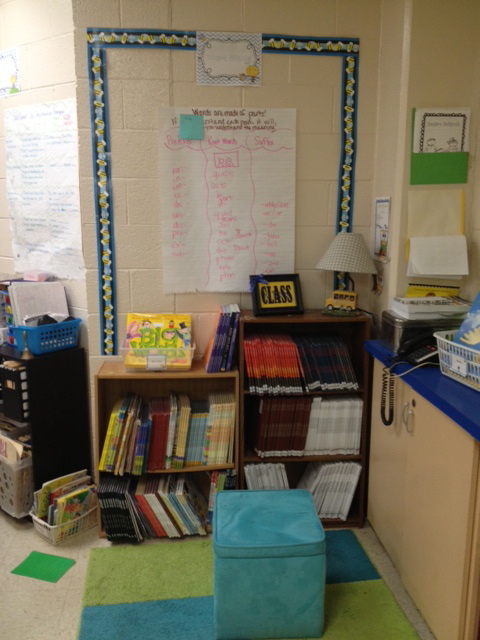 This is our Word Study section. 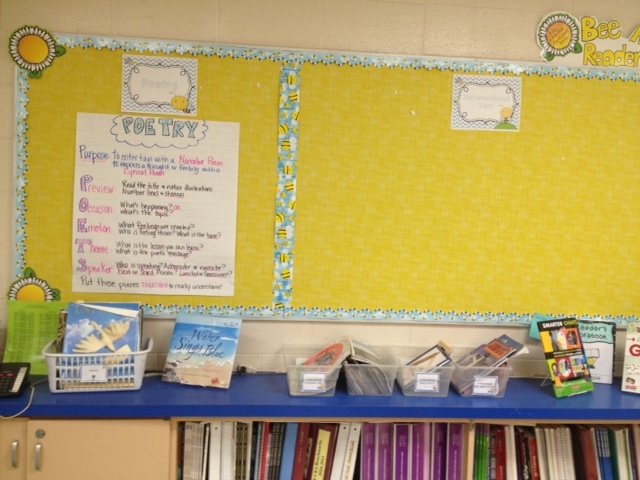 We started our word study this year with a root word study and began building our anchor chart. 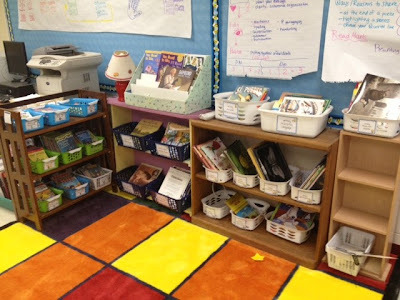 The books on the shelves are class sets of picture books we use for shared reading. 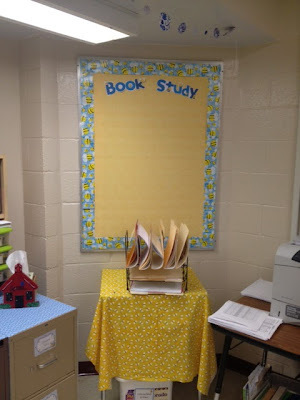 You can read about Word Study here. 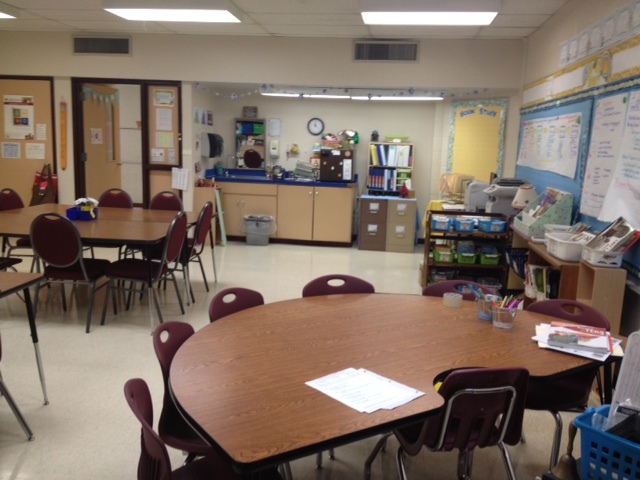 This is the view from behind my Guided Reading table. From the side of my Guided Reading table! Tools are behind the table, on the bookshelves and on the wall. This is the library space next to my Guided Reading table. 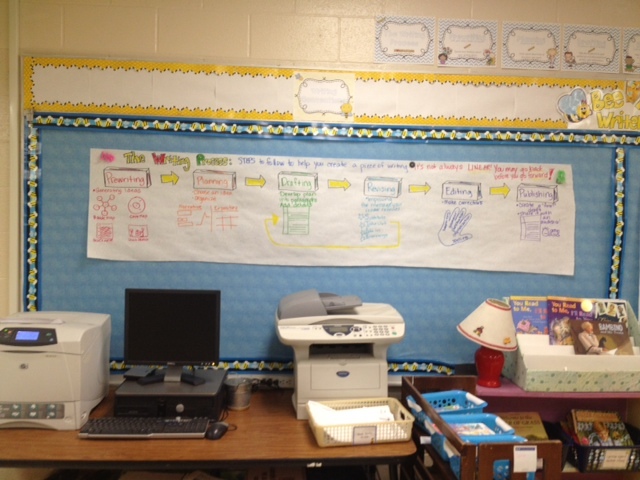 On the walls are tools for writing planning; anchor charts we've built together about writing go here. In the baskets on the shelves are books that are mentor texts for writing! 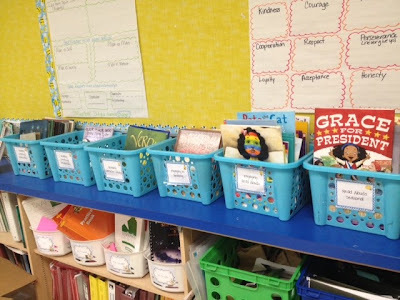 I have them organized by what writing strategy they're good for, such as "Careful Word Choice," "Great Beginnings," or "Shifting Point of View,"
I need new baskets, though. These were fine for novels, but they're not really suited to picture books. 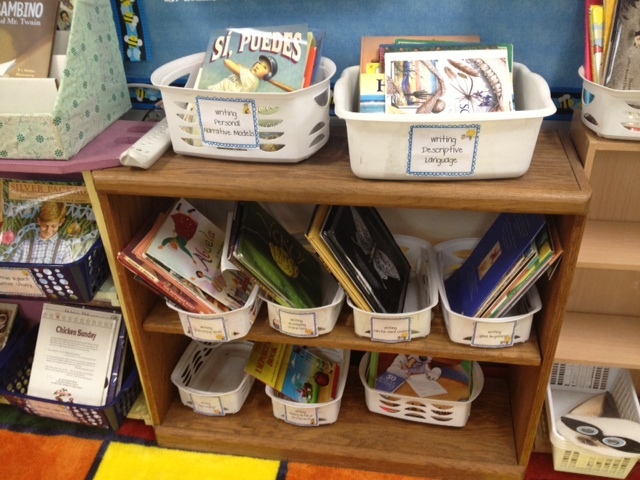 These baskets hold mentor author books. There's Cynthia Rylant, Jane Yolen, Eve Bunting, and Patricia Polacco. This is the wall next to the classroom library. 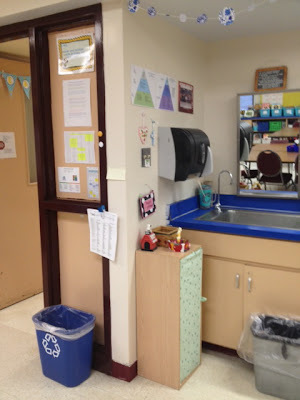 It currently has our Writing Process map, but eventually I'll place our sample anchor charts for conventions (grammar, spelling, punctuation, capitalization) here. The table also houses the printer and the scanner (and required ancient computer which I ONLY use to operate the scanner. Everything else happens on the laptop.) 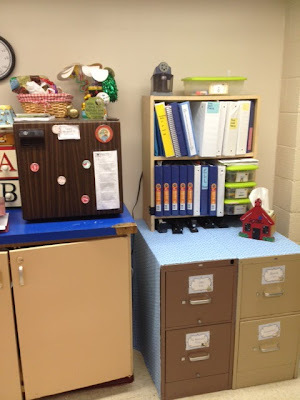 I use the scanner solely for scanning the answer documents for our common assessments. Before they're scanned, the answer documents go in the basket. 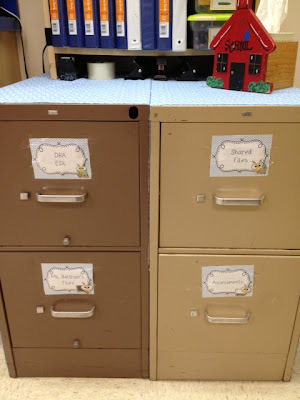 After they're scanned, I return them to the teachers in their boxes. 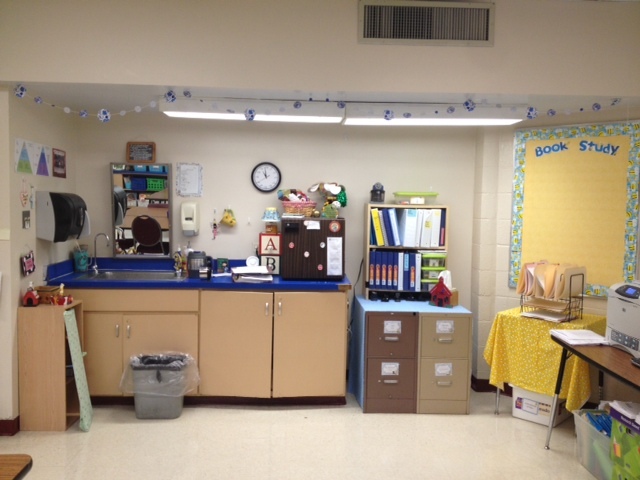 This is the whole room from the opposite end; near the Guided Reading table. Here's the wall by the door. 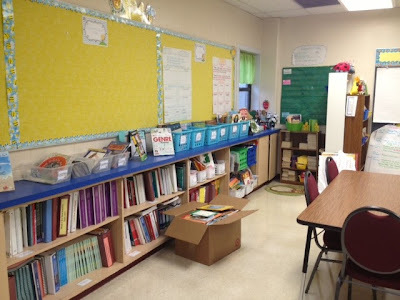 The shelf is full of my grade level planning binders that have our district scope & sequence, the TEKS, released state tests, and our lesson plans that we create. One of our plans this year is to have an optional book study where teachers can participate by reading and collaborating. Our first book is going to be Igniting a Passion for Reading by Stephen Layne and we'll start it in October. 1. 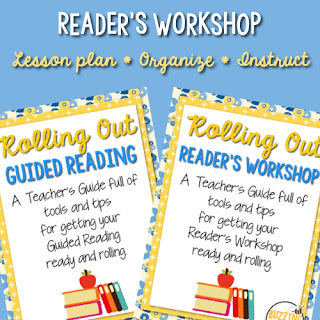 Copies of the DRA/EDL Teacher Observation Guide for teachers so they don't have to make their own. They're in file folders by level, DRA first, and EDL after. 2. Ms. Beltran's files (all of my stuff from teaching. My math & science stuff is boxed up, but I kept my reading, writing, and social studies stuff in case I can use it to help my teachers. 3. Shared Files: a new idea! 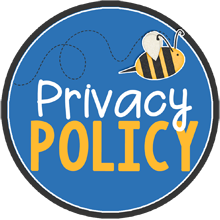 The shared files will hold formats, tools, handouts, etc. organized by content. 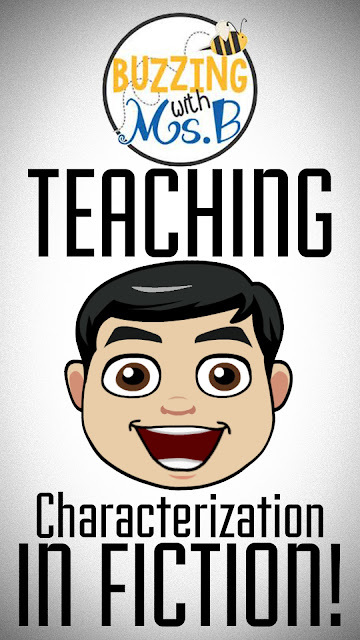 Teachers can add to them as they create or use things, and we'll increase our bank of tools! 4. Assessments. We make a lot of common assessments and I'd like to organize them! So I'm housing them here. The door! With my bunting: READ! So glad to finally get this posted! I hope you enjoyed your tour! 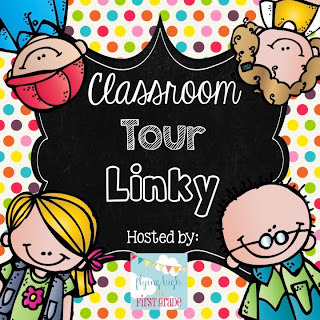 Link up or check out the other fabulous rooms linked up! What's important about fiction? The Year of the Pocket Chart! 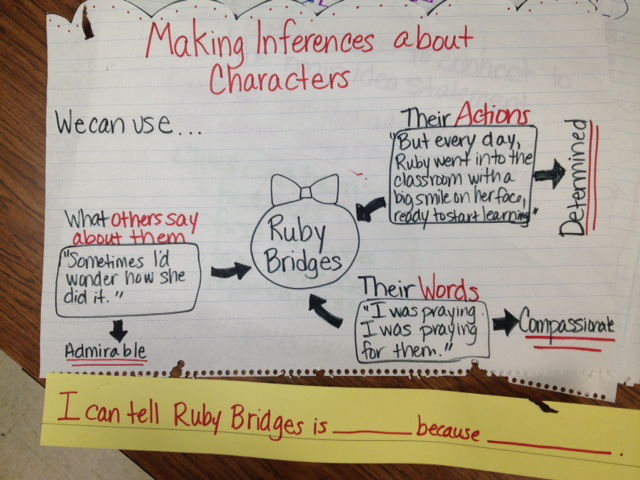 First, we had the kids make predictions about each element on a sentence strip. Then we stuck them in the pockets! After that, as we read, we re-read our prediction strips and altered them, if necessary. 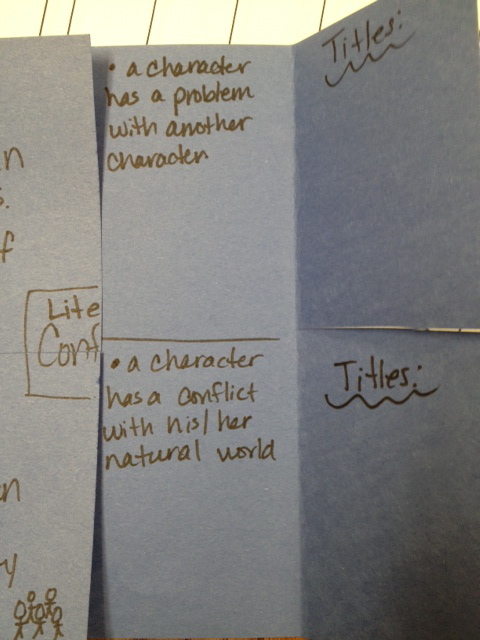 At the end, we taped them all together and had a nice, brief summary of the fiction story! 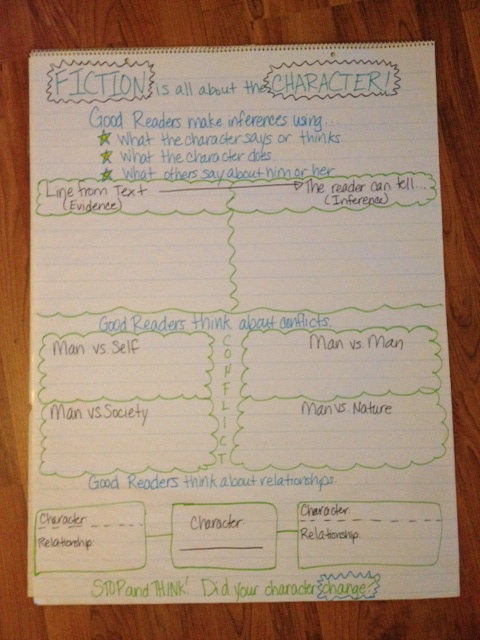 We also used this simple (and goofy) graphic organizer for kids to fill out while reading. It was basic enough that kids were able to recreate it as they read a fictional piece! And you know what, they actually did use it on their Test. My babies. 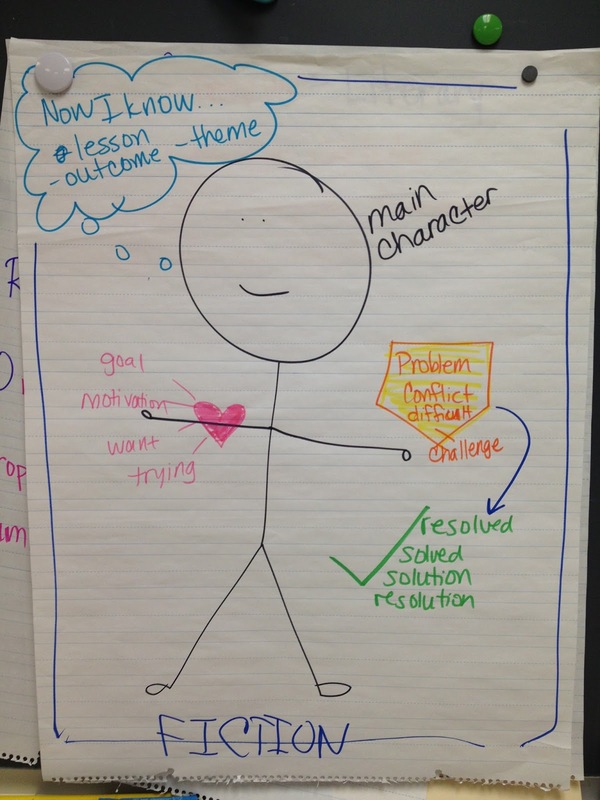 We also use Freytag's Pyramid for fiction, but we needed our kids to have a simple anchor to hold on to before we complicated things too much. 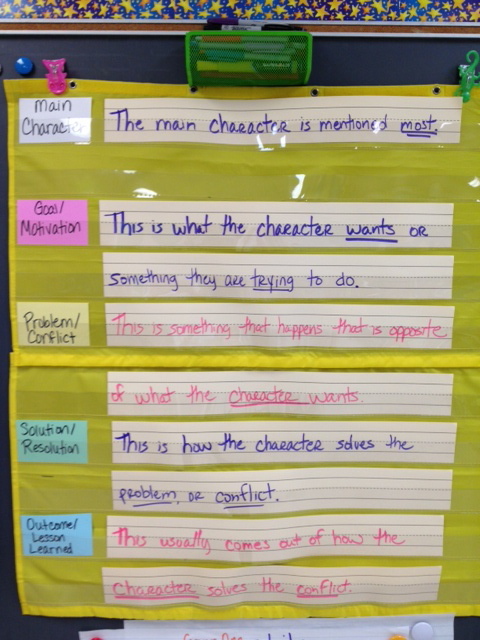 How do you support fiction text structure? What's important about fiction? *Chant/Song! So last year, we had a few kids in fifth grade who didn't pass The Test. And by a few, I mean a lot. In Texas, fifth graders take The Test once in March and then the kids who failed get another opportunity to retake in May. So in the meantime, we had to make some things happen for these kids. 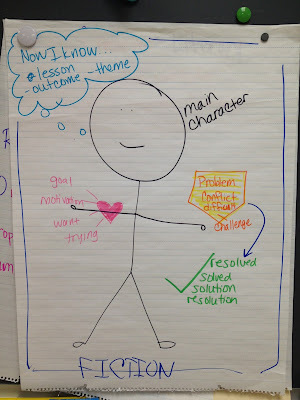 After talking to the kids about what areas they struggled in, and after talking with Rachel Reyna of Fisher-Reyna about some helpful strategies for comprehending, we realized our kids didn't really know what to look for when they read different genres. Their previous experiences (K-4) hadn't really been genre-based, and they were struggling to navigate different genres and know what to focus on. 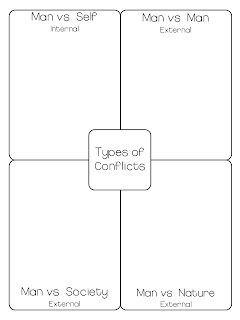 At this point, we put together some strategies to help them focus on the structure of the genre first, to improve their comprehension. We started with fiction. Fiction is special because in fiction, we have characters. As I mentioned in my previous post, Fiction is all about CHARACTER. Our kids were lacking that understanding. 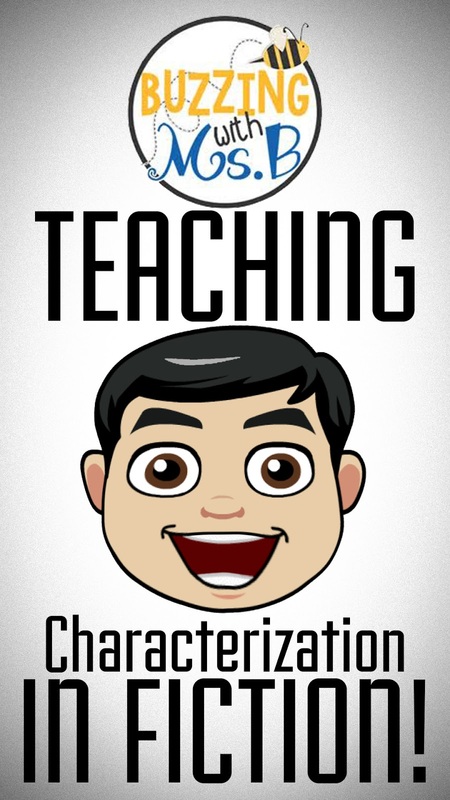 So my teaching buddy, Chris, and I put together several tools for them to help them focus on this. They worked so well and really gave kids an "anchor" to hold on to, so we're now using them during our fiction unit at the beginning of the school year in grades 2-5. First, we wrote a chant. It's to the tune of a cadence, or sound-off. You see them most throughout the text. Their actions unfold as the story is told. Becoming the problem, yes indeed! Their solution begins to evolve. 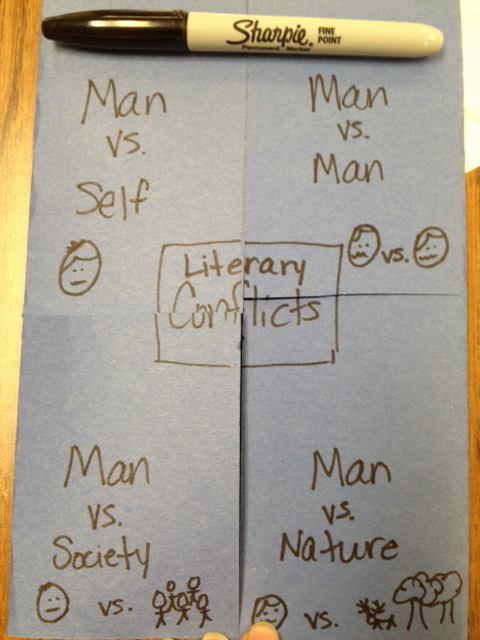 Fiction, Drama, Poems, THE THEME! Ok, so I make no secret of it - I'm a bit of a chub. I mean, I know myself, and that is kind of my figure. It's curvy, in all the right places... and a few other places, too. So I'm getting married in October, and I thought, "I'm gettin' me some Spanx." I pulled a package off the rack and closed myself into the fitting room. I stepped in - delightfully smooth, I would say- and I started to pull them up. I pulled on one side, and then I pulled on the other side. And then I got to my hips. There was no way my large, child-birthing (not that I've actually had any children yet) hips were going to magically compress themselves enough to fit into that tube of fabric. I would've had to use plastic and a blow-dryer. Not happenin'. I returned that size to the rack. And, refusing to be defeated, I returned to the fitting room with a larger size. They pulled riiiiiiight up. Maybe they didn't smooth out so much, but they sure did fit better. So I stuck with that set, because it didn't make me want to die. Or hack pieces of my hips off to squeeze into them. I went to the seamstress today with my bridesmaid and my mom, and I took my handy-dandy Spanx. I stuffed myself into them and strapped them on. I popped my wedding dress on. And it looked GREAT! So then I went home. I went into my bedroom to change, and then I realized... I OWN SOME SPANX! I looked in the closet and noticed how many dresses I own that I don't wear because I'm a chub-o and my tummy sticks out. Or my hips stick out. Or both. I started to grab dresses of the rack and stack them on the bed. So I've made a decision. I wear a dress = I wear Spanx = I look terrific. Yay! 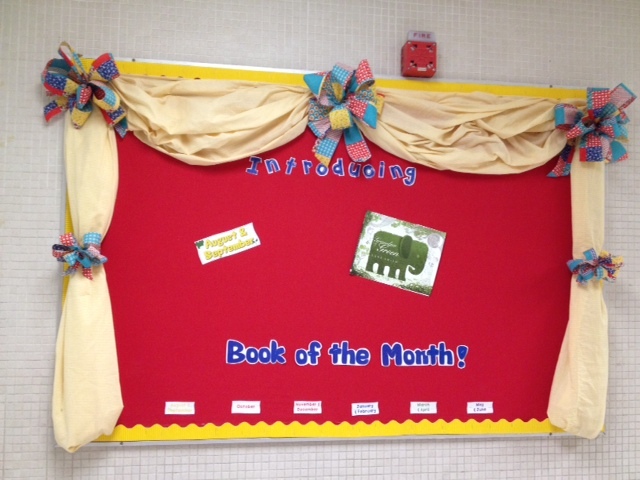 To encourage the love of reading campus-wide, our campus purchases a Book of the Month for each teacher. It's actually the Book of Every Two Months, but that sounds pretty lame. 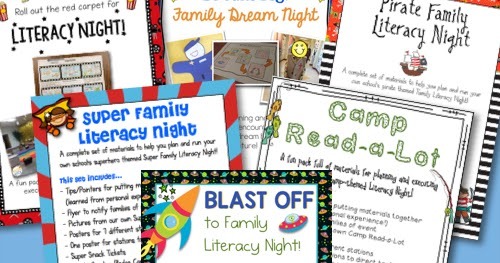 This year, we have several juicy reads lined up for our kids to respond to as a whole school! 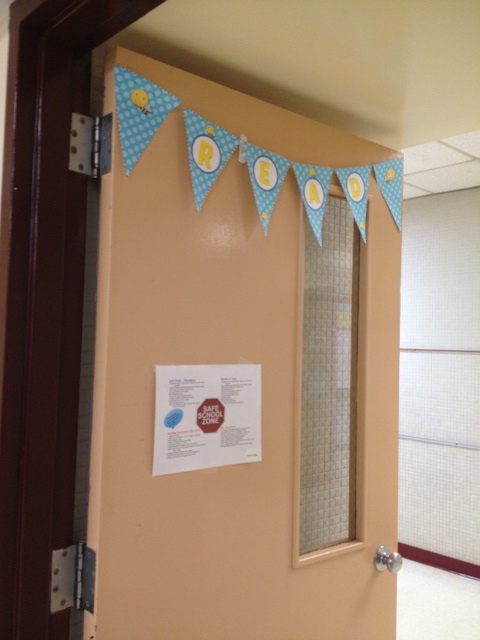 In the main hallway, I put up (with the help of my buddy, Sylvia) a cute, simple bulletin board to display the current book of the month. Across from that board, there are some glass-doored display cases. 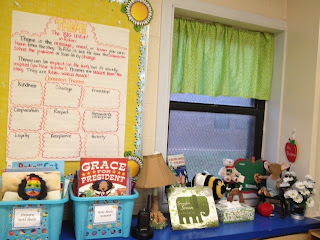 Each time we have a new book, a grade level is responsible for filling the display cases (and there are a lot of them) with their students' responses or projects about the book! I need to figure out some more stuff to put on that board. There's kind of a lot of empty space! Across the bottom, I have the months we are releasing books. Every time we release a new book, we'll add the old one to the bottom. 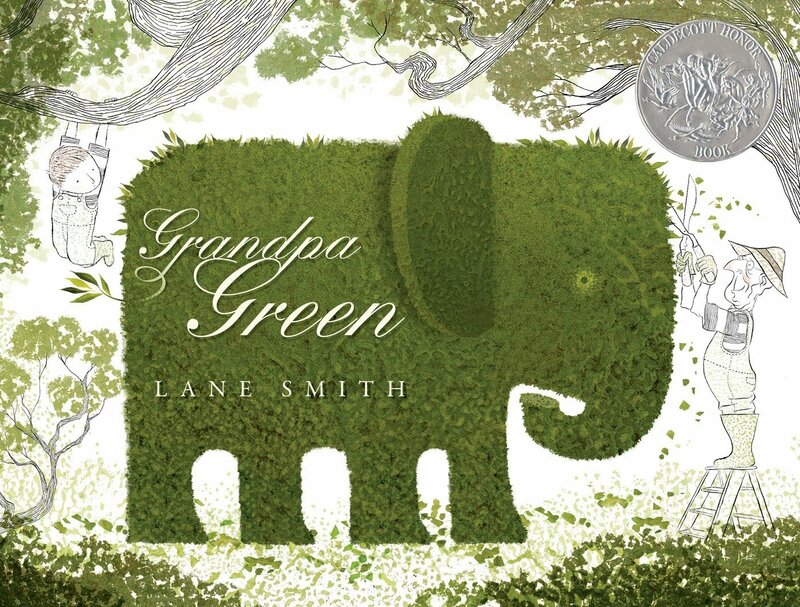 Our first Book of the Month is Grandpa Green. This book is so charmingly simple, but surprisingly complex! 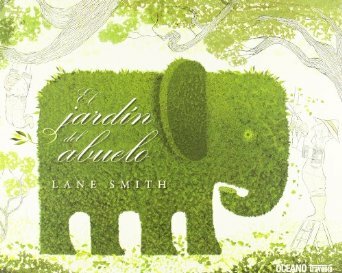 One of the great things about Grandpa Green is that it comes in English and Spanish (El Jardin de Abuelo). Here's my Book of the Month letter to the teachers. Maybe you can add Grandpa Green to your collection! 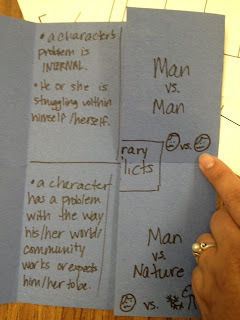 Fiction is all about Character! *Freebie! My teachers grades 3 - 5 are working hard on introducing fiction to their kids. We've built in tons of read alouds and shared reading experiences to help kids practice noticing, finding evidence, and making inferences about characters. To do this, we're using a few different books. 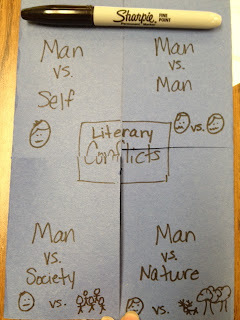 I really recommend using short stories with upper elementary students. Books like Every Living Thing by Cynthia Rylant and Baseball in April and Other Stories by Gary Soto make the perfect vehicle for giving kids multiple opportunities for analyzing different characters within a short time span! 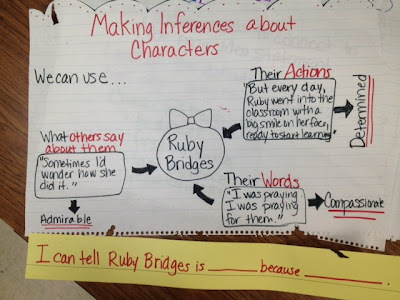 To give kids a handle on character analysis, we started building this anchor chart. We added something different to it with each lesson, making sure that we were focused on analyzing elements of character that hit our TEKS and standards! It was a lot to fit on one chart, but we did it! 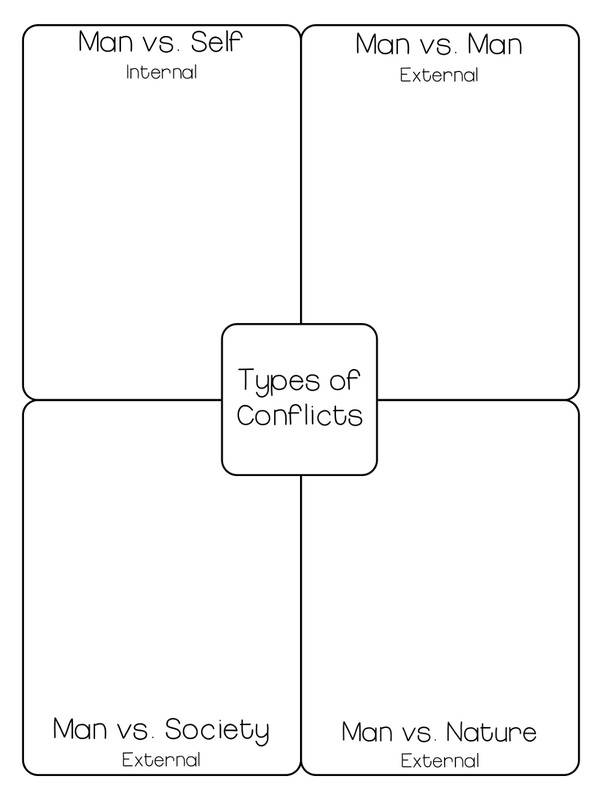 To focus on character conflicts, we created a foldable and a simple graphic organizer. 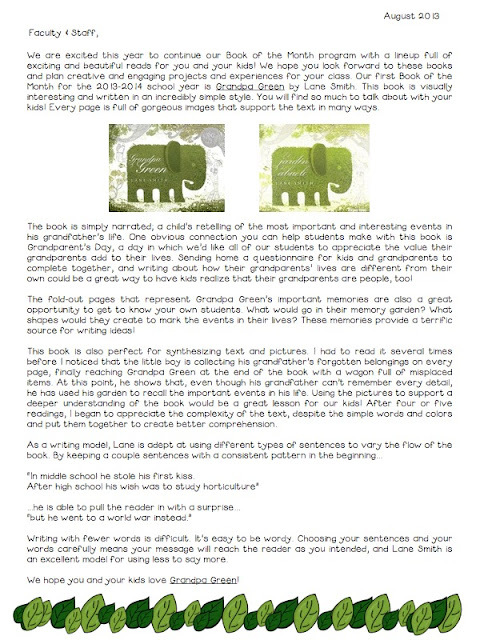 Grab it here for free on GoogleDrive! Teaching That Makes Sense. Click on "The 5 facts of fiction!" 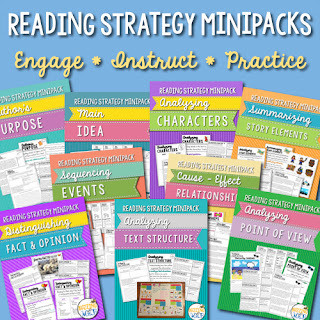 And check out my Character Analysis Strategy MiniPack on TPT! So today was our first planning day since school started! 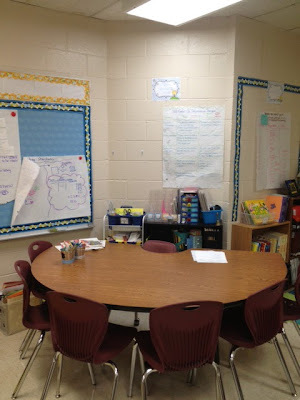 I plan with three grade levels one week on Tuesdays, for an extended 90-minute planning period. Then, I plan with the other three grade levels the next Tuesday. Today I met with third, fifth, and first grade. 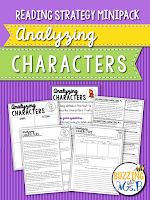 We're getting started with our fiction study by really spending some time on character analysis. I'll have more on that in a few days! Excited to share some of the ideas we came up with! 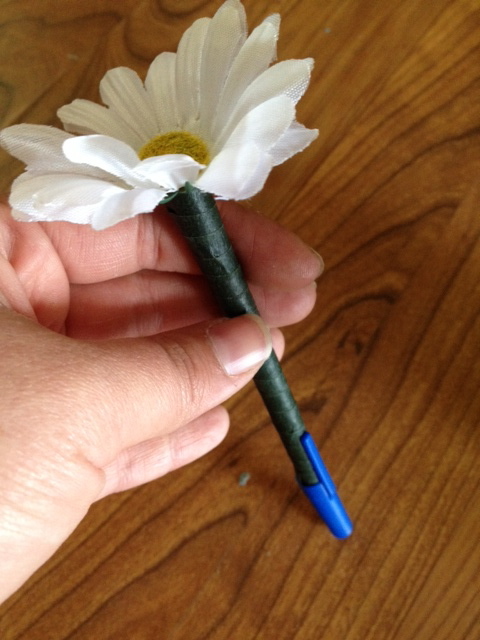 To kick off our year on a positive note, I spent about an hour or two last night making 40 flower pens! 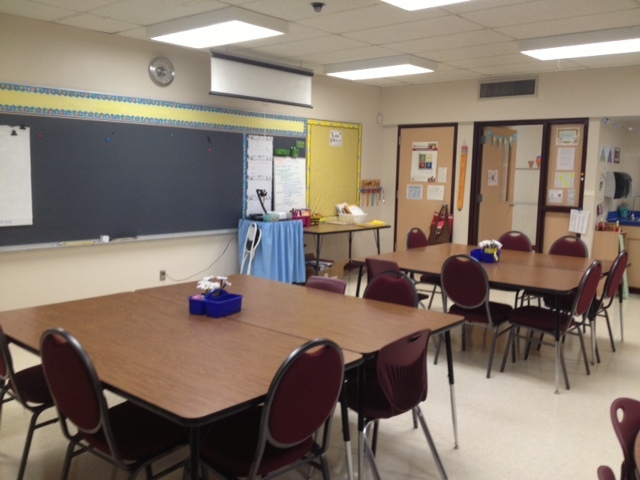 I followed the directions Tanja from Journey of a Substitute Teacher wrote as a guest blogger on my blog two summers ago. They were easy to follow and the pens turned out so cute! You can find the directions here. 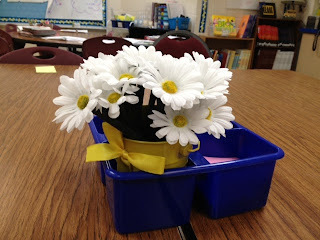 Each teacher walked away today with a pen, and I saved a few to cute-ify my room! Love these, and they took SOOOOO much less time than the Rolo Pencils I did last year!